My favorite cookie is the Oreo. Love. Them. Well, I’ve never really met any cookie that I haven’t liked. However, I do have a soft spot in my heart (and my tummy) for a warm and chewy homemade chocolate chip cookie. You know it’s a great cookie even before you’ve placed them in the oven when you’re devouring the dough from the spoon, and slapping your husband (lovingly, of course!) for wanting the last schnibble-schnabble of doughy, chocolatey goodness. Then, once it bakes, your house is filled with this glorious aroma of family. Chocolate chip cookies smell like family. 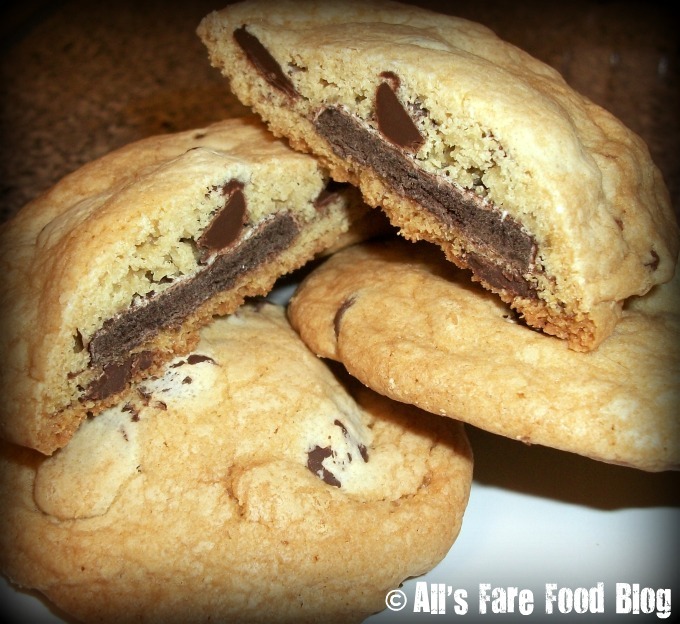 A few weeks ago there was a buzz online of a recipe of – wait for it – Oreo Stuffed Chocolate Chip Cookies. I know. My heart just skipped a beat. I don’t know how I hadn’t thought of it earlier. We stuff so many things already – our hamburgers, our French toast, our pancakes. Heck, we put chickens, inside ducks, inside turkeys for Thanksgiving. So why not stuff our cookies, too? It’s a bond that wasn’t formed soon enough in my book. The original recipe came from the blog “Picky Palate” around early January. But, it wasn’t until I read a blog from SeriousEats.com that I realized I must try this recipe or I wouldn’t be doing my readers any justice because how can I call myself any sort of food blogger if I don’t take one for the team and try this behemoth? Serious Eats baked up both an Oreo cookie and a Nutter Butter version of the stuffed cookies. In the end, they liked the Nutter Butter version more (it was also a chocolate chocolate chip cookie dough base). So, I took to the grocery story to pick up the essentials. I used the Picky Palate’s chocolate chip cookie recipe for my base. For the filling, I had both Oreo cookies and Keebler’s Grasshopper Fudge cookies (think: Girl Scout Thin Mints). The second dozen, which was the Grasshopper Fudge version, were much smaller but manageable. While I really did enjoy the Oreo-stuffed version because it was slightly more cakey and gooey, I was surprised how much I really liked the Grasshopper Fudge version. The mint from the cookie paired so well and it wasn’t overly sweet like the Oreo counterpart. Still, a glass of milk was a great BFF. I know so many of you out there are receiving your orders of Girl Scout cookies this week. I think this recipe would be perfect for Thin Mints, Caramel Delites (I refuse to call them Samoas) and Peanut Butter Patties. My final thoughts on these fabulous cookies? These are serious cookies. If you have an intense love for cookies like I do then I think you’ll enjoy them. But beware – you can easily go into a sugar-induced stupor. These little nuggets of goodness pack a wicked punch of sweetness. I thought a deep-fried Oreo could prepare me for a stuffed cookie, but no. Yet, my mind has been blown and I’ll never be the same. These treats are featured on “Sweet as Sugar Cookies” Sweets for Saturday Post. This entry was posted in Cuisine - Desserts, Recipes and tagged bloggers, desserts, Girl Scout cookies, Grasshopper Fudge, Keebler, Nutter Butter, Oreos, Peanut Butter Patties, Picky Palate, recipes, Samoas, Serious Eats, Thin Mints by Christina. Bookmark the permalink. Thanks for the invite Lisa! I love your blog – all the recipes look so delish!